Our 6th visit to Interalpin did not disappoint! Mountains, machines, buses, beer, it had it all so we have taken some time to summarise to those unable to make it! It also marks the ten year anniversary since the first time we went to Interalpin in 2007. After a small wintery delay in Oslo, the Norwegian.no flight took to the skies heading for Munich! No ordinary flight, but almost as if to celebrate the 10 year anniversary of Trakkemaskin.no trips to Innsbruck, our very own Ole Kr Hole Olsen was up front as the pilot's first officer! A long time dream for him, there seemed to be compliments all round for the flight and landing! Well done Ole Kr, and thanks on behalf of Trakkemaskin.no! 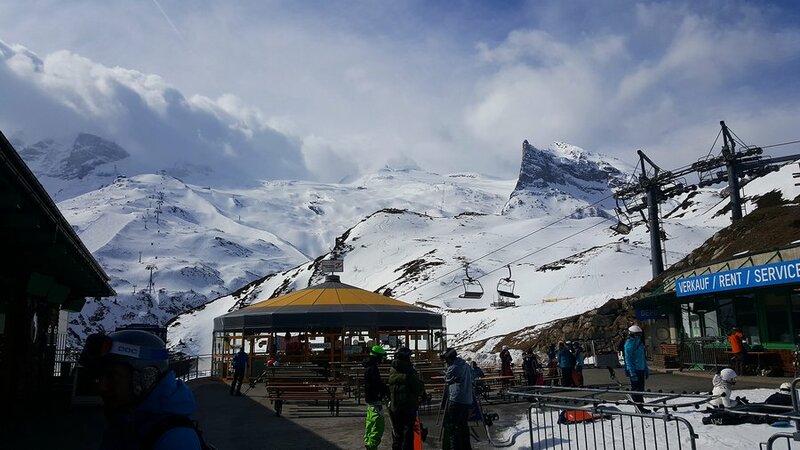 So after an overnight beer or two in the beautiful Mayerhofen, we took an early bus trip to Hintertux Mountain, to the frustration of the many skiers on route (including local school of 20) who found Trakkemaskin.no members had taken command of most seats leaving standing room only. 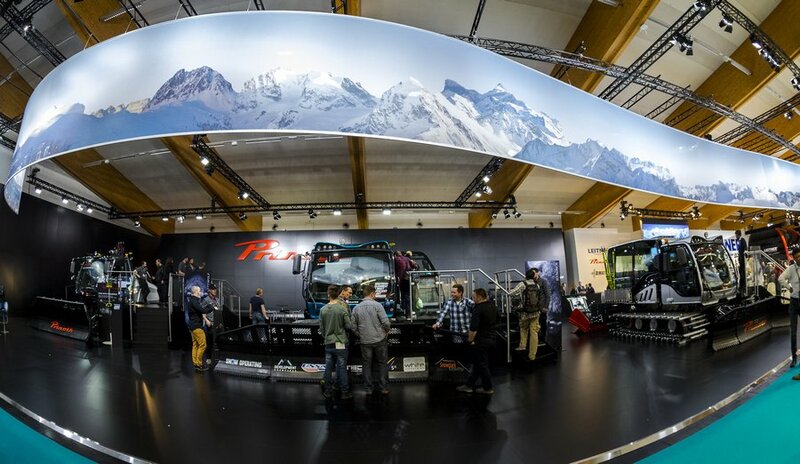 The Hintertux tour consisted of gondola access, gondola store, drive station and of course their Trakkemaskin garage! A big thank you to Mathias Dengg and staff for the warm welcome and the knowledgeable tour. An impeccable example of how ski areas and workshops should be kept and maintained. 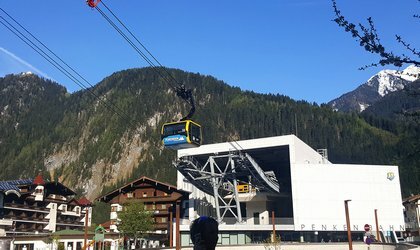 After some crew enjoyed the firm snow, and others consumed some mountain beer, we all descended for transfer to Innsbruck by the awaiting coach. 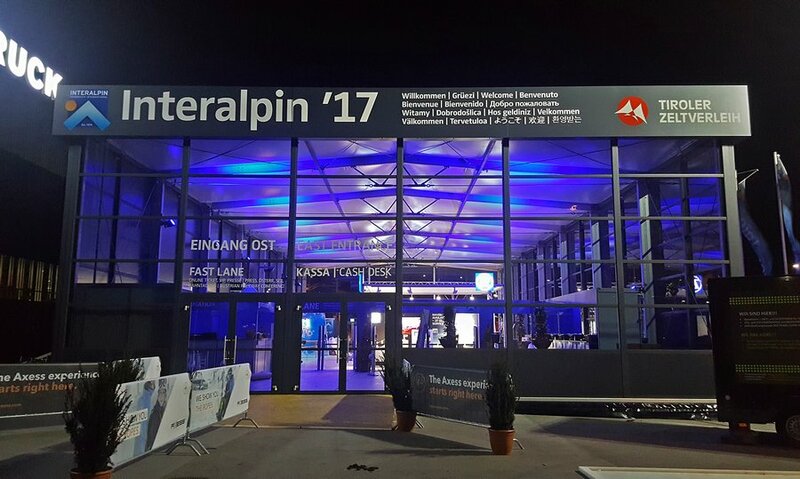 After a refamiliarisation night, the trade show was soon upon us, making use of our tickets supplied this time by norwegian sales representative for Prinoth, Owren AS. We all entered with a few focus areas in mind.....Trakkemaskin's of course! 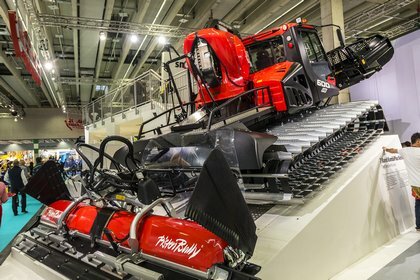 below is our summary of the two main stands of Pistenbully and Prinoth. So the display was stunning, making use of angled ramps to mimic natural mountain environments and walk platforms to allow access to the machines, Pistenbully displayed a 100, 100 FunSlope, 400 Park Pro, 600E+ and not quite the unveiling expected (recent rumour of a 600XL or a new generation machine), but the new 600 Limited Edition or LTD. Also on display was Snowsat, the slope and fleet management system with snow depth measurement which assures savings in both snowproduction, fuel consumption and machine running time. 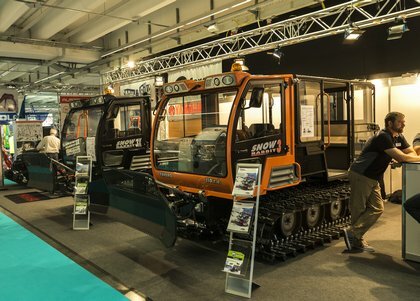 Company Schneestern was also on hand telling about their impressive parkprojects and giving useful advice. The Pro Academy were also present, with Florian Profanter explaining the benefits to be had from basic training to efficient snow management and Competition snow grooming. 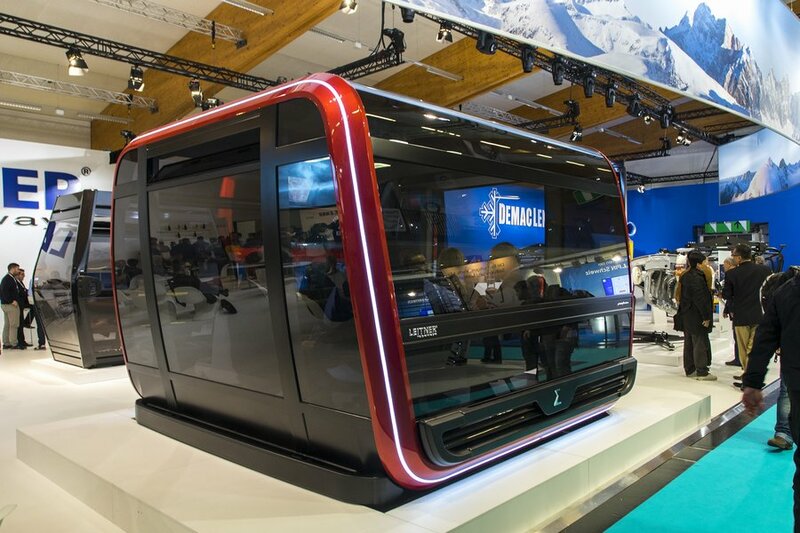 Sadly there were no technical advisors around to explain the products but from what we could see, the new products getting attention were the 100 FunSlope (or Park), the 100 due to the new joystick recently suggested to be intended for the entire range and the 600 LTD. 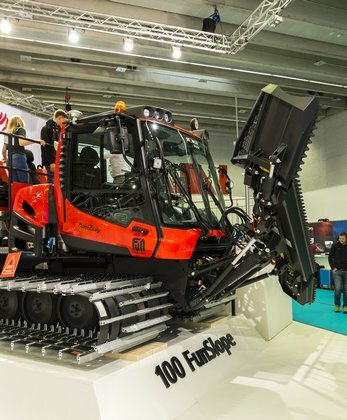 The PB100 FunSlope will no doubt be useful for those with smaller stations, or small parks where the bigger investment is not required. The small parkmachine got improved kinematics on the front push frame, up to 131°. Also two lifting cylinders compared to a standard machine. The blade is improved for better backblading. As for the joystick, well that will be a personal choice but at first view and feel, there's a lot of buttons for one finger to deal with, main advantage is that you can utilise 4 main functions at one time! 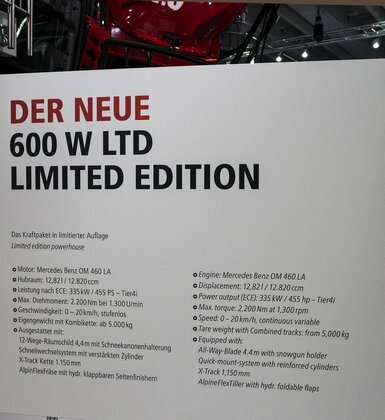 The Limited Edition strikes you with its new black and red colour scheme. So what's 'Limited' you ask? 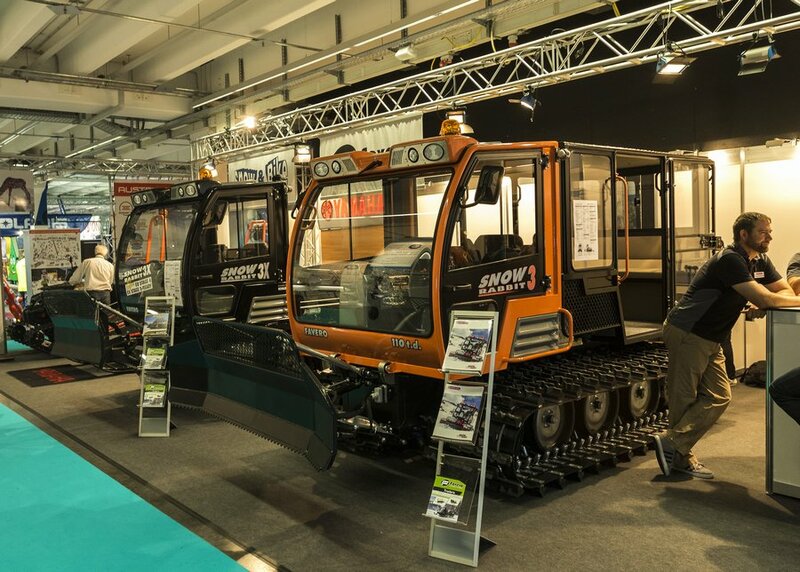 Well there's only 50 solo and winch vehicles available with exclusive design and equipment. 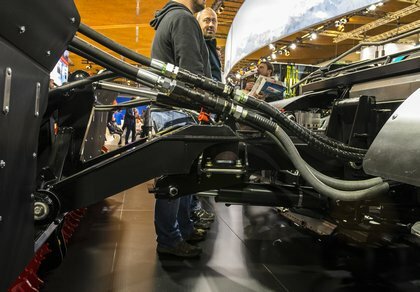 Full chrome exhaust, black finisher, colour coded rail and mirror holders, colour tiller camera, 4000lm LED's to name a few of the limited edition differences. 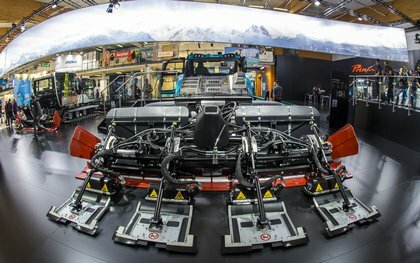 A little disappointing to see that PistenBully still haven't moved on to Tier 4 final engines. If you can afford it, you get a tasty Limited jacket too! 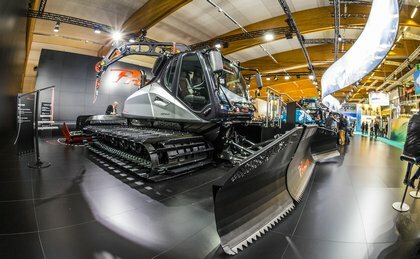 In the usual professional yet alluring black and red, the Prinoth stand was understated, but clear to see were the pride of fleet Leitwolf X with park blade and Winch, New Bison X with Nordic liner track setters and a new Husky with transport cabin. 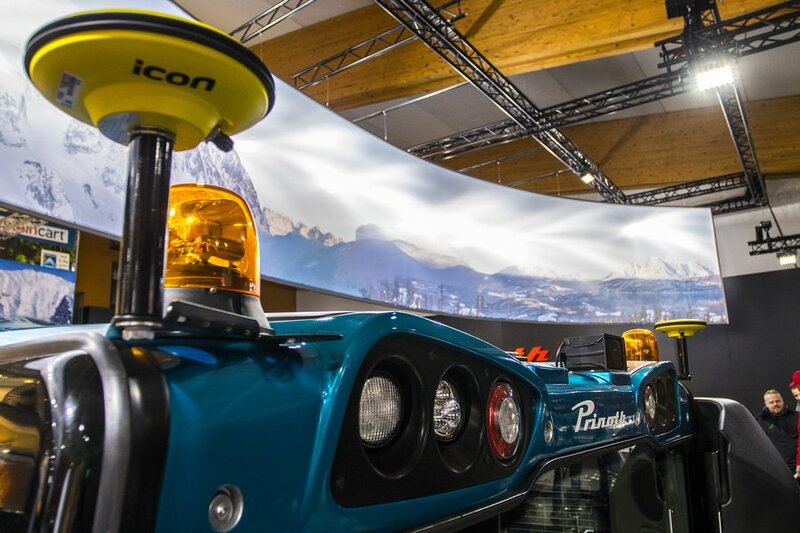 In addition, technical experts and users were on hand to answer queries and indeed thank you to Andreas Muigg, Head of Program- & Product Management at Prinoth, who took time to walk us through the products and improvements on show. 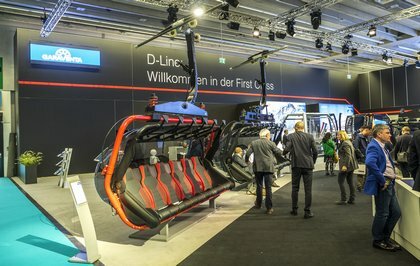 The Leitwolf is well tested now, but on show was the innovation trial of rope winch cable. Not the first to try this, but maybe aware of Aztec findings, Prinoth are using an alternative product following experience elsewhere in the Leitner group of expertise. This is something that was very evident and the future of the Prinoth product appears to be making best use of its specialist knowledge elsewhere, including tried and tested design and materials from their partner company products to bring simplification, consistency, interactivity and efficiency. 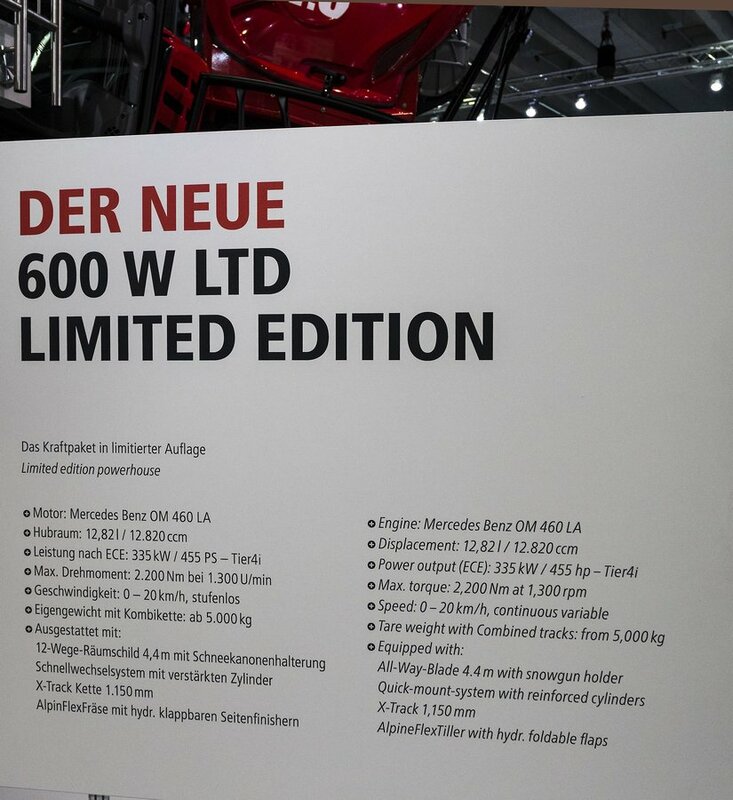 So the rope was clearly demonstrated to be at least 1/5th of the weight of steel cable, but they acknowledge it will not replace the steel cable for all applications. Those where damage could be incurred by rocks, trees or other 'rubbage' during deployment. But this will be well thought of in cooperation with the customer. 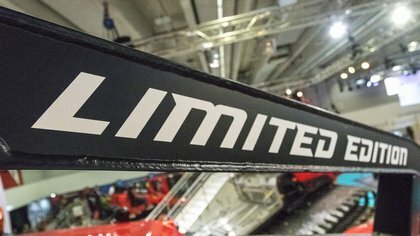 A quality sign is that also world known manufacturer of cranes Liebherr is using the same type of rope. 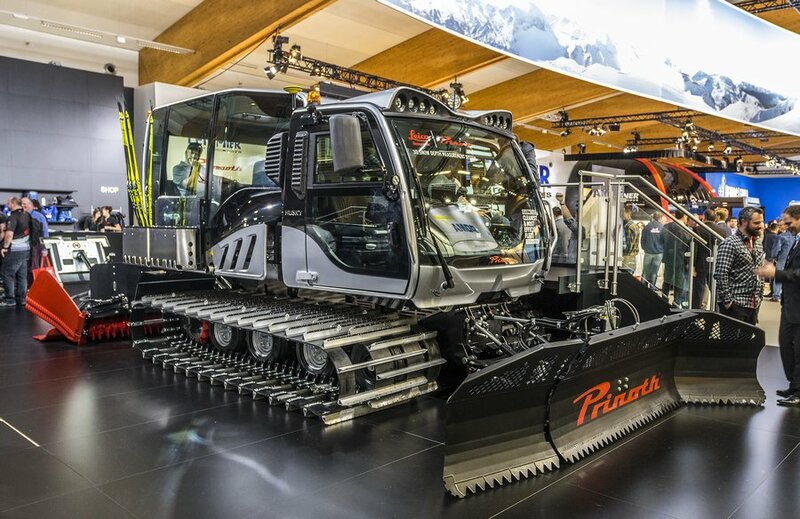 This is an 'option' for users, being produced by Prinoth to offer improved efficiencies and weight reduction. 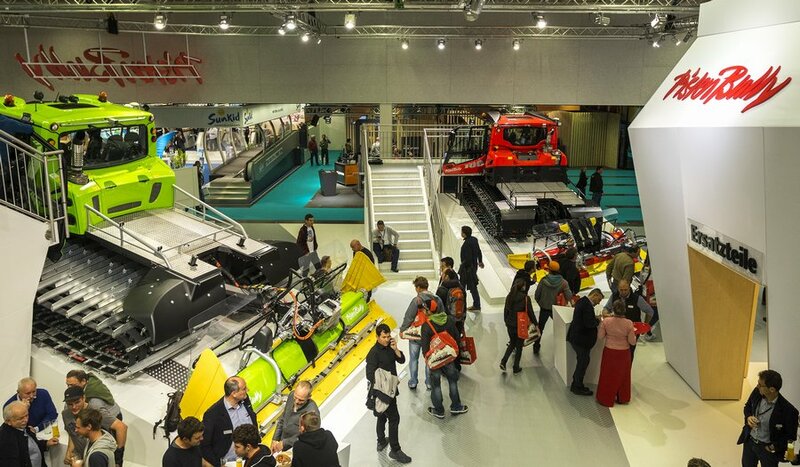 Indeed, where your slope and winch point can avoid damage, the rope offers around a 500kg saving per 1200m. A detail to notice is the small modification done to the fenders on the back on the Leitwolf. Here Prinoth have added som "brushes" around the front and back edges. This after a customer who made the same mod also gave the input to Prinoth. The brushes furter reduce snow finding it's way to the tiller and the newly groomed surface. The brushes on the front reduces snow blowing up in the air forward and giving clean air to the intercoolers. 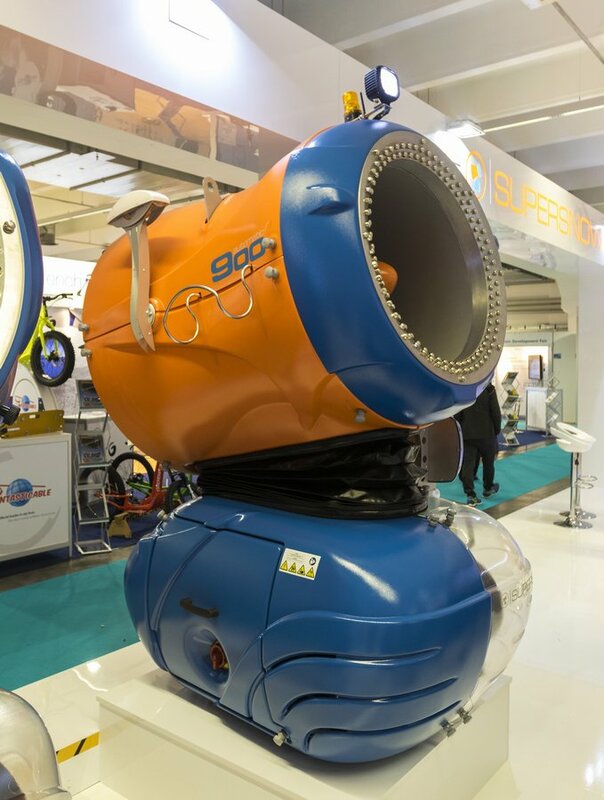 This helps to stopp ice build up from the snow that before passed through the hot air from the coolers melting and then freezing again. New Bison X was equipped with none less than four tracksetters and tracktillers, in Prinoth terms known as Nordic Liner. The new rear lifting frame on the Bison is offering improved following of the main tiller and tracksetters in corners compared to the old model. The Nordic liner demonstrated the Norwegian testing and experience. 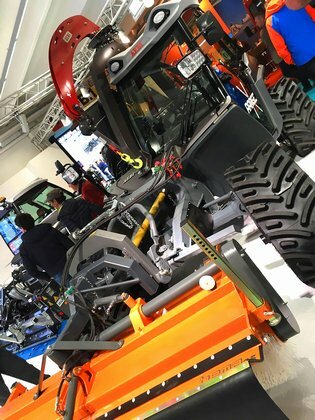 Since the track setting plates and the tillers can be used independently, the use of the tillers can vary depending on the requirements and the condition of the trial. 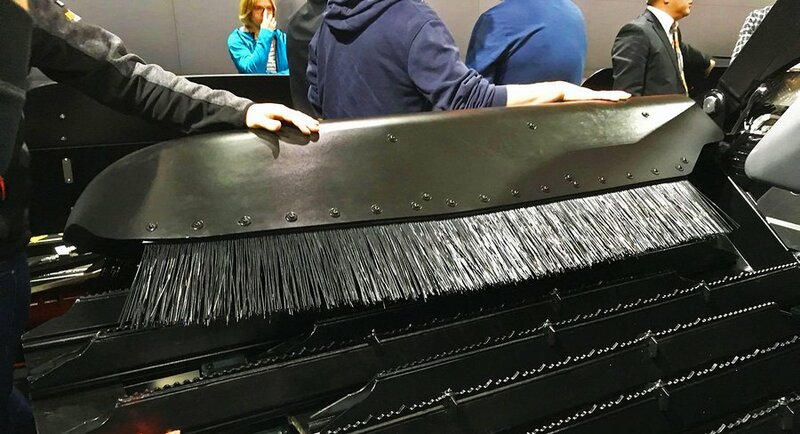 If a slope has already been prepared and only a cross-country track needs to be treated, then the vehicle's tiller can remain inactive, thereby saving fuel. It's improved tracks from Gamstkette, also available for all other brands of machines, are reported as providing improved climbing and turning. All Prinoth machines from Husky to Leitwolf X had the Leica iCON alpine Snow Management system onboard. 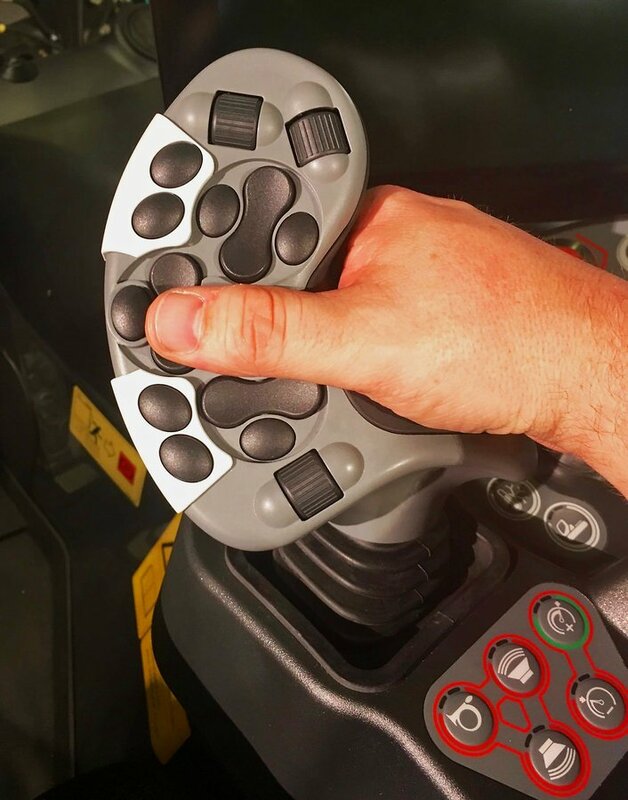 A 3D system offering live data in the cab with multiple sensors for measuring on the machine. 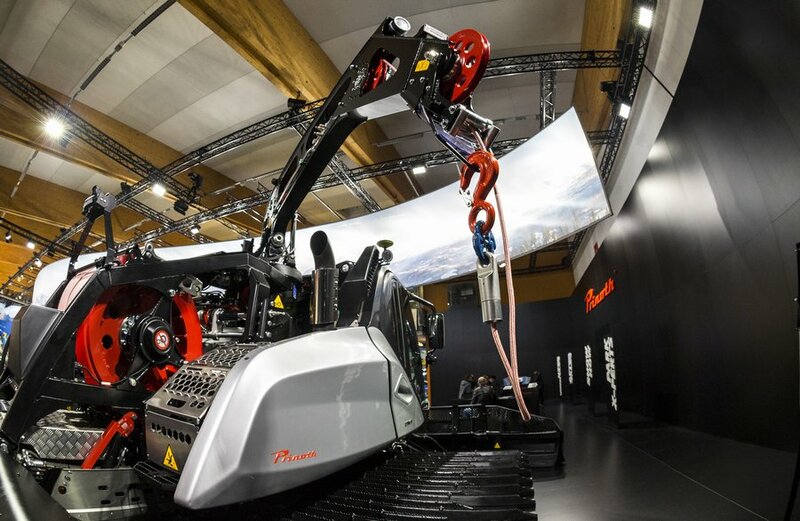 The system differs from other similar systems with the fact that it has sensors on the blade of the machine. Prinoth also had the X-Community on hand with park experts from F-Tech, Development Snowparks, White Industries, Snowpark Consulting, FIS, and Snow Operating all on hand for customers. You also had a chance of looking at second hand machines together with the after sales team. There was much much more to be seen and we could have spent another day taking in I an improved stand from Aebi, who were showing their impressive pride of fleet including the TT281 XR with winch. 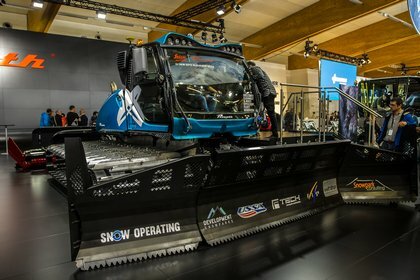 Supersnow had an impressive and attractive stand to demonstrate their efforts to compete in provision of snowmaking equipment. 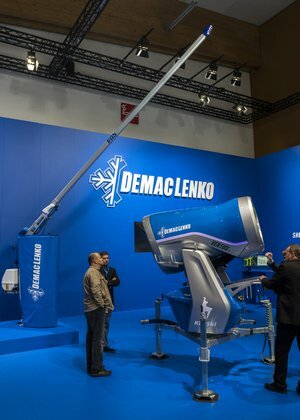 They unveiled their new manual but semi-automatic '900' snowgun, the 'top gun' above their 600 and 700 automatic models on offer. 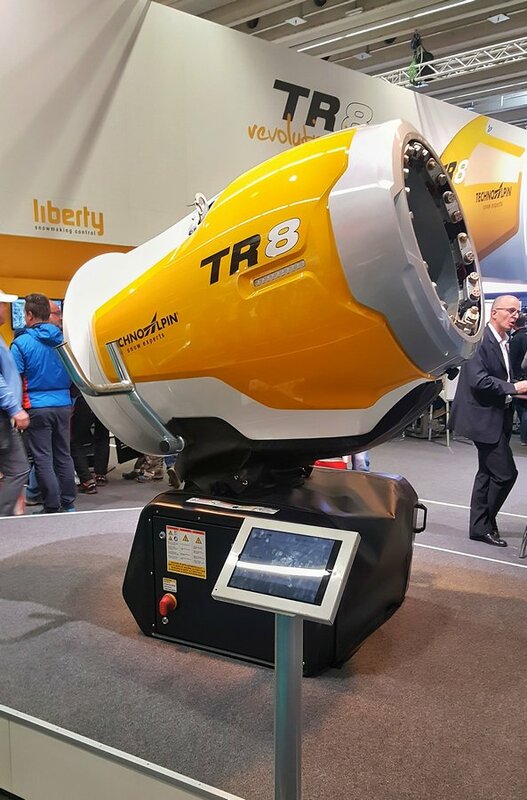 The new TR8 technology from technoalpin was on show and advertised the future of combining one motor running both fan and compressor. Also in focus was the easy service! 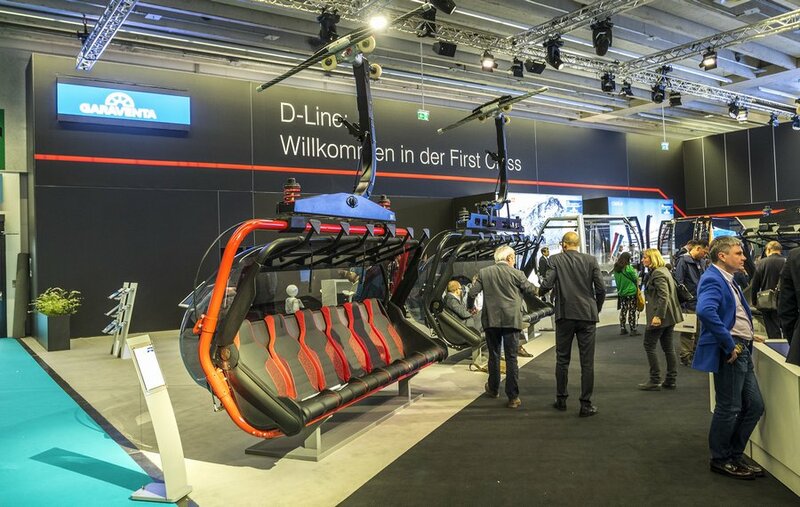 Luckily there were several lift and gondola products on show, with Dopplemeyer having a useful 8 seater chair to help rest tired legs! Loop 21 stood out in bright green offering bolt-on emergency communication & entertainment systems for safer gondolas. In all, an impressive display of products, innovation and combined thinking to improve winter operations of ski areas....but Interalpin, we ask you to do one thing for 2019....sort the entry system to reduce the line ups everyday!